Me: Right, the first question was asked by quite a few people, including Paul Bass, Jenny F, someone called Menny, and Rob Shearman. They all want to know this: Now that you’ve seen the Hartnell stories, would you go back and change any of your scores? Have your feelings towards the early Hartnell stories mellowed at all? Sue: Is that really the best question Rob Shearman could come up with? Sue: Oh. Okay. Well, my answer is no. I stand by my original reactions. I like to look forward, not back. Me: The next question is from Tristan Alfaro. Are you aware of the cult following you have acquired? Sue: You did say ‘cult’, didn’t you? Sue: If they’re busy doing that, it keeps the rest of us safe. Me: The next question was asked by Lewis Maddox and Thomas Bowyer. If you could sacrifice one surviving episode to see one that’s been lost, which one would you sacrifice, and for which episode? Sue: I’d get rid of the Toymaker one and I’d replace it with The Tenth Planet Episode 4. But only because you’ve been banging on about it for 20 years, Neil. Me: And from David Whittam: Are you actually enjoying this? Sue: ‘Enjoy’ is a very strong word. However, it’s nowhere near as bad as I thought it was going to be. Let’s put it this way – I’m still here, aren’t I? Me: The King of the Subterranean Penguins asks: If William Hartnell was a bed, what sort of bed would he be? Sue: He’d be hard on the outside and soft on the inside. Me: I prefer Nev Fountain’s answer: Crochet-y. Okay, next we have a controversial request from Simon Harries. Should one wish to black-up in the style of a 1960s Doctor Who guest actor (Freddie Jaeger, Bernard Kay etc) in the privacy of one’s own home, purely for ironic purposes, what tips could Sue offer in terms of the make and shade. Also, should it be a cream or powder compact? Sue: Please refer to the 16-page private email which Neil made me send to you. Me: Next up we have Graham Kibble-White, and he wants to know how and when did Neil reveal the fact he was a Doctor Who fan to you, and how did you respond? Me: He writes for Doctor Who Magazine. Sue: Well, I’ve never read that. So there. Me: The next question is from Rory Pond. That probably isn’t his real name, by the way. Sue: Maybe it’s the actor who plays him? Me: Yeah, probably. Anyway, ‘Rory’ asks: If you knew then what you know now, would you still have gone ahead with this experiment? Sue: (After a very long pause) Yes. It keeps my husband busy, and he assures me that we’ll be able to retire on the royalties from the t-shirt eventually. Sue: That name must be made up as well. Me: Steven asks: What are you looking forward to the most about attending Gally in Los Angeles next year? Sue: Shopping on Rodeo Drive. That and hiding. Me: And now it’s time for an incredibly personal question from Sean Alexander. He wants to know whether our marital relations have been affected by the experiment. And if they have, has it been in a good or a bad way? Sue: It has – we talk a lot more. We have to. I guess that’s a good thing, isn’t it? Me: Bringing the tone down even further we have John Williams, co-editor of Tachyon TV, with the inevitable shag, marry or kill: Terry Nation, Dennis Spooner and William Hartnell. Sue: Kill Terry (obviously), shag Dennis (he’d make me laugh) and marry Hartnell. He’d be too old to take an active interest in me. Me: Next we have Matt Bartley with: If Matt Smith’s Doctor bumped into the first Doctor in the new series, who should they get to play him? Sue: Can’t they get the guys who did the latest Tron film? Me: Ian Berriman asks: Which Doctors are more physically attractive than Neil? (Peter Cushing is allowed). Me: He isn’t the Doctor! Sue: What’s the other one’s name? The Scottish one? Sue: Well, you did ask! Me: Okay, you’ll like the next question, it’s from Chris Orton: What’s been your favourite hat in the series so far? Sue: Barbara’s. Did Barbara ever wear a hat? If she did, Barbara would have had the best hat. And if she didn’t wear a hat, there are no decent hats in the series so far. Does that answer the question? Me: In a similar vein, from John Paul Green: What’s been your favourite example of set design and/or carpentry in the series so far? Sue: The Smugglers. That was too easy. Me: And finally, Malcolm Y asks: Is Tesco Tony single? And if he is, can I have his phone number? 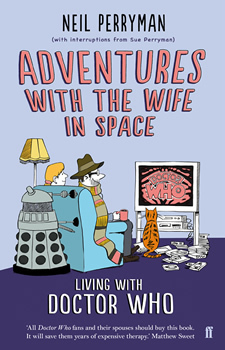 Questions I didn’t dare put to her included: “Has black and white Doctor Who ever got you in the mood, Sue?” (Steve O’Brien) and “Will you marry me?” (name withheld). Me: So, do you think you’ll miss William Hartnell? Or are you glad he’s done and dusted? Sue: I’m glad he’s done and dusted. But you never forget your first, do you? And I do admire him – he’s the only actor who didn’t have anything to go on. Everyone who came afterwards had his performance to build on. You can’t take that away from him. I’ll never be a fan but I warmed to him as we went along. As for missing him, it depends how bad the next one is. Me: If you had to sum up William Hartnell’s portrayal of the Doctor is three words, what would they be? Sue: Moody, odd and sad. Me: Has anything surprised you about these old episodes? Sue: Yeah, I was constantly shocked by the violence. Doctor Who definitely isn’t a kid’s show. Me: And finally, which era of the show are you looking forward to the most? And which era are you dreading? Sue: I’m looking forward to Matt Smith. Me: We’re only doing the original series, love. Sue: We’ll see about that. Okay, I’m looking forward to Peter Davison – he’s easy on the eye. And as far as dreading goes, I’m torn between Colin Baker and Jon Pertwee. Pertwee because I remember him driving around in that stupid yellow car – I must have seen it as a child and I don’t want to see it again – and do I have to explain Colin Baker?